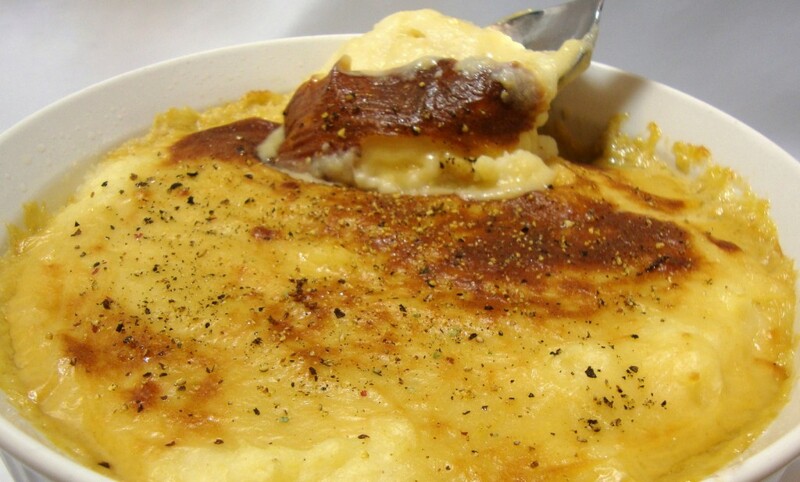 A fluffy and creamy gratin of whipped potatoes and parsnips blended with non-dairy butter, tangy non-dairy Crème Fraîche and gooey, melted non-dairy Jarlsberg cheese. If using the Crème Fraîche, prepare according to the cookbook instructions and refrigerate until ready to use. Non-dairy milk can be used instead, but the flavor and richness of the gratin will be altered somewhat. Peel and cut the potatoes into large chunks. Place the potatoes immediately into a large cooking pot with plenty of water to cover. This will prevent oxidation of the potatoes (turning brown) while the parsnips are peeled and sliced. Peel and slice the parsnips. Add them to the pot with 1 tablespoon of salt. Bring the water to a boil and cook until the vegetables are fork tender, about 15 minutes. Avoid overcooking. While the water is coming to a boil and the vegetables are cooking, prepare the Jarlsberg Melt and set aside to cool. Preheat the oven to 350°F. “Butter” a large baking or casserole dish and set aside. When the vegetables are done cooking, drain them thoroughly in a colander for a few minutes and then transfer to a large mixing bowl. Add the butter, salt, white pepper and nutmeg and mash thoroughly using a potato ricer or masher. Add the Crème Fraîche or non-dairy milk in increments and whip the mashed vegetables with an electric rotary mixer (if you have one). Otherwise continue to mash by hand until the mixture is smooth and fluffy. Note: Never use a blender or food processor to mash potatoes as this will damage the cell structure of the potatoes and cause them to fall flat or become gooey. When potatoes are boiled, their starch granules swell. If those granules are broken too vigorously, the cells release large quantities of starch, resulting in potatoes with a pasty consistency. Transfer the mixture to the baking dish and top with the Jarlsberg Melt. Bake uncovered for 30 minutes and then place under the broiler for 1 to 2 minutes to achieve a bubbly and browned cheese crust on top. Serve hot. Jarlsberg shares flavor similarities with Swiss cheese and can best be described as mild, buttery and nutty with a hint of sweetness. Do not omit the ground coriander, even though only a small amount is needed, as it is essential to the flavor of this melt. This recipe yields about 1 cup of melted cheese. *The sherry or wine can be omitted for health or ethical reasons, but this will alter the flavor profile. In a small saucepan, vigorously whisk together the ingredients until smooth. Cook the mixture over medium-low heat, stirring slowly and continually with a flexible spatula. As the mixture thickens and curdles (forms lumps), begin stirring vigorously until the curds disappear and the cheese becomes very thick, smooth and glossy. Set aside until ready to use in the recipe. Chipotle pepper in adobo sauce adds a spicy and smoky kick to this velvety pumpkin soup. For timid palates, the chipotle pepper can be replaced with a mild chili powder. *For fresh roasted pumpkin, cut a sugar pumpkin in half. Scoop out the seeds and strings and place the halves face down on a foil-lined baking sheet. Bake at 350°F until soft, about 45 minutes to 1 hour. Cool and then scoop out the flesh. Freeze any remainder for other recipes. 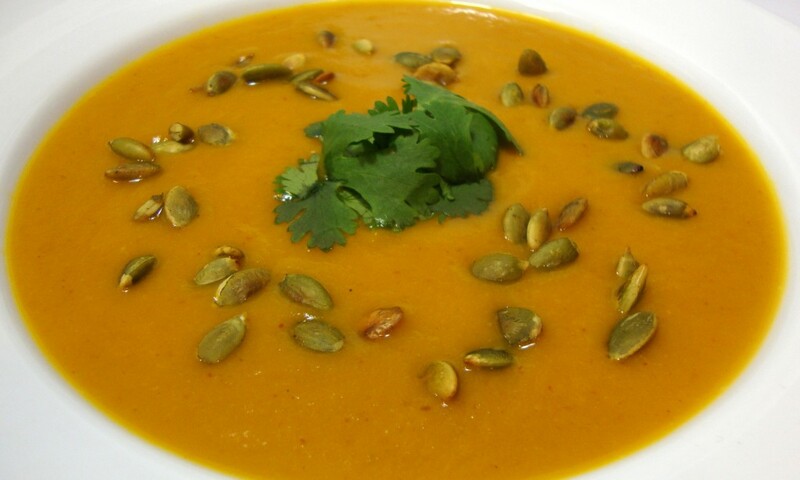 Butternut squash can also be used in this recipe as an alternate to pumpkin. Simply follow the same roasting technique. Add the olive oil to the skillet and place over medium heat. Add the onions and sauté until lightly golden. Add the garlic and sauté an additional minute. Transfer the mixture to a blender. Add the pumpkin, 2 cups of stock or broth, the chipotle pepper and the cumin and coriander; process until completely smooth. Transfer to a large cooking pot and add the remaining stock/broth. Bring to simmer, partially cover and cook for 30 minutes; season with salt to taste. Ladle into individual bowls and garnish with the toasted pepitas and optional cilantro. Serve with warm flour tortillas if desired. To warm the tortillas, roll them up securely in foil and place in a 350°F oven for 10 to 15 minutes. 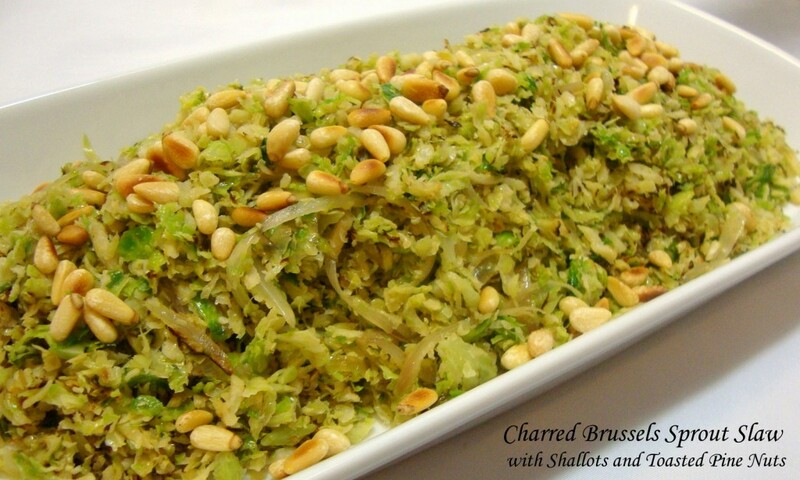 This dish is very easy to make and may just win over dinner guests who never cared much for Brussels sprouts before. Any cold leftovers make a unique and delicious Spring roll filling. • fresh Brussels sprouts, about 1 lb. In a large skillet or wok, melt the butter or margarine (or heat the oil) over medium-low heat. Add the shallots and garlic and a pinch or two of salt. Sweat the shallots and garlic, about 10 minutes. You should hear a faint sizzle – if the sizzle is loud, reduce the heat a bit. The goal is to draw out flavor without browning the shallots or garlic. Add the slaw and a pinch or two of salt. Increase the heat to medium-high. Stir the mixture occasionally. The goal is to slightly char or caramelize the vegetables just a bit. If the vegetables seem dry, add another tablespoon or two of non-dairy butter, margarine or olive oil, if desired. Cook until the slaw is tender crisp. Season the slaw with black pepper to taste and add additional salt as desired. Sprinkle with the toasted pine nuts and serve immediately. 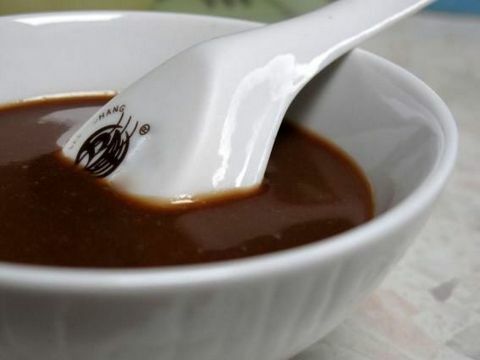 Hoisin is a thick, aromatic condiment sauce with a salty and sweet flavor. It is commonly used in Chinese cuisine as a grilling glaze (superb for seitan, tempeh and tofu); as an addition to stir fries; or as dipping sauce (try it with spring rolls). It is also used as a condiment for phở, the classic Vietnamese soup. My homemade variation contains no added sugar, starch, gums, starches, colors or preservatives, unlike most of its commercial counterparts, since the fruit naturally sweetens and thickens the sauce. This recipe yields about 1 and ½ cup. Add all the ingredients to a small saucepan and bring to brief boil. Remove from the heat and let the mixture cool. Add the mixture to a blender and process until smooth, about 1 minute. Press through a fine mesh sieve back into the saucepan to catch any stray particles. 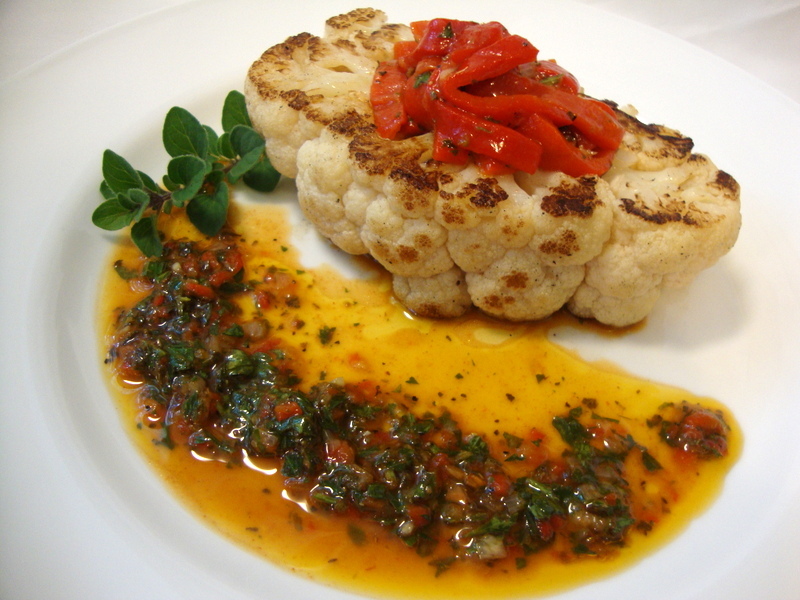 Transfer to a sealable container and store in the refrigerator until ready to use; the sauce will thicken as it chills. Due to its salt and vinegar content, the sauce should remain preserved and fresh for a few weeks.